The Embassy of Nepal, Bangkok celebrated the 69th National Democracy Day in Bangkok from 18 to 20 February 2019. In the morning of 19 February 2019, His Excellency Ambassador Dr. Khaga Nath Adhikari hoisted Nepal’s national flag at the Embassy premises. 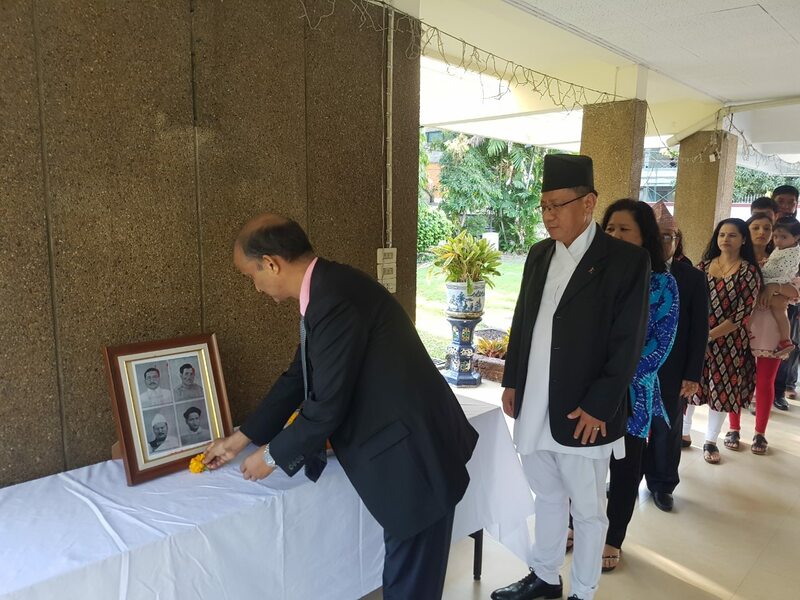 Then, the official programme commenced with the playing of Nepal’s national anthem, one minute’s silence in memory of the Martyrs, and laying of garlands and flowers on the photographs of the Martyrs. Embassy officials, staff members and other Nepalis were present during the morning programme. Deepawali is being observed in the Embassy premises for three days, from 18 to 20 February, to celebrate the National Democracy Day.